How to do party games a lot better! Children love nothing more than playing party games when it comes to birthday parties. Conventional wisdom would say to choose the games the children are familiar with and enjoy. What if I told you that there’s an improved way to play these games, but with far more fun for the children? As a professional children’s entertainer, it’s my job to maximise enjoyment for all so here’s my party game secrets. Most games involve elimination with the last child remaining the winner. This is a bad idea. First of all it leads to the possibility of those eliminated to run around chaotically causing havoc. Secondly the children get bored and upset when eliminated. Instead of eliminating children decide who was the best at the end of the game. For example, with musical bumps you explain that you are looking for the fastest boy and the fastest girl. After a few minutes pick the winners, no one is left waiting at the sides and all remain participating. This also works well to pick children who haven’t yet won anything. From experience children love musical statues. Here’s how I make it even better. Instead of freezing, they have to assume the pose of a popular character. Peppa Pig uses a fist for her snout, a finger for her tail, bends her knees and oinks like a pig (naturally). Even the boys enjoy this. I choose the best boy pig and best girl pig. Other characters I get them to impersonate are Spider-Man, Batman, a plate of wobbly jelly and I get them to pull their funniest face. By far my most popular game is guess the theme tune. It’s quite easy to set up. Most modern phones have a dictaphone app. Record the theme tune from YouTube with this app, hook your phone up to a dock system and you have the makings of a fun game. If you have an iPhone this is very simple and if you don’t own a docking system more than likely a friend will. I’m not sure how this works with android devices though I imagine it wouldn’t be tricky with their popularity. Some stereos have an audio in socket so you just need to buy a cheap lead from Maplins and your good to go. Caroline the owner and principle face painter of Neon Fairy Face Painting, a Basingstoke based business happily serving The Hampshire area and beyond! A working mum to two young boys I am delighted to be sharing on North Hants Mum. Let us enchant you with our magic! From fantastical animal and fairy designs to action heroes and aliens we simply LOVE transforming them into their wildest dreams! 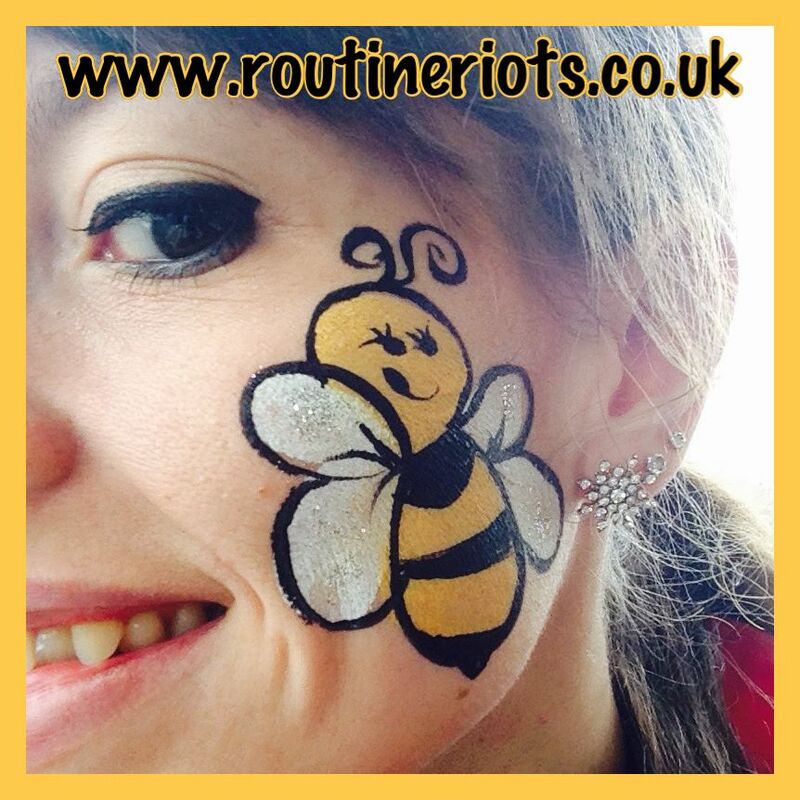 Professional experienced and friendly face painters we are constantly updating our training, use only non toxic professional products and hold full insurance and enhanced CRB disclosures for peace of mind. We also have a colourfull online store with premium party boxes , downloadable party invites, bespoke tutus for princesses of all ages, Hen night accessories and more! Let us dazzle your little princesses with our original fairy and princess face designs, glitter in a myriad of colours, gems and diamontes, glitter and temporary tattoos, premium princess party boxes for guests, tiaras and princess colouring sheets. 1.5 hours or sparkly magic for up to 10 children. These parties can be adapted to suit boys too for Pirates, dinosaurs or superheroes, face painting, glitter tattoos, party boxes and also fake wounds and gory painting for older boys too! Mark your special journey with a bespoke gestational art or baby bump painting. Incorporating dates and designs of significance to you and your family we can create a bump painting just for you along with complementing smaller designs for siblings and other family members. I met Sarah through NHM over a year ago and I’ve had several family photo shoots with her since. She takes fantastic photo’s that are very reasonably priced. The parties sound like great fun, and I love the idea of having photo’s to document the whole experience. If you would like more details about Sarah’s studio over at Viables, please see the related posts below. Princess Parties are aimed for little ones aged 3 – 7. At the party, your child can dress up and be made up to feel like a fairytale princess or swashbuckling pirate. Don’t worry if you don’t have party dresses – we can supply those too! Prices can vary depending on your specific requirements – please contact me for further information! The Modelling party is a fun two hours. Come and be treated like a model with five guests – party invites are included in the price and sent to you with the party booking information. You will be greeted with drinks (mocktails for under 18’s) and party nibbles. The Shoot is held in a party atmosphere and, if the weather is nice, we go out in the local grounds and do some on-location shots. Bring along your favourite outfits and change as much as you like to work those Top Model poses! Once the party is over and we have some amazing photographs, I will edit the photos (which is normally a ten-day turn-around) and place them on a CD. There will be a minimum of 5 photos per person, and a letter giving you permission to print will be supplied with each CD – meaning that the images can then be printed anywhere at your convenience. Parties are normally held at the studio – but if another location is required, this can be discussed. Please contact Sarah Dutton Photography for more information on the above two parties! You can also find Sarah’s Facebook page HERE. Kim sent me a very sweet email asking if she could do a guest post for Routine Riots on NHM. I saw some of the photo’s from the Easter event that she hosted in Chineham Village Hall and it looked like a fabulous event. It’s such a great idea. 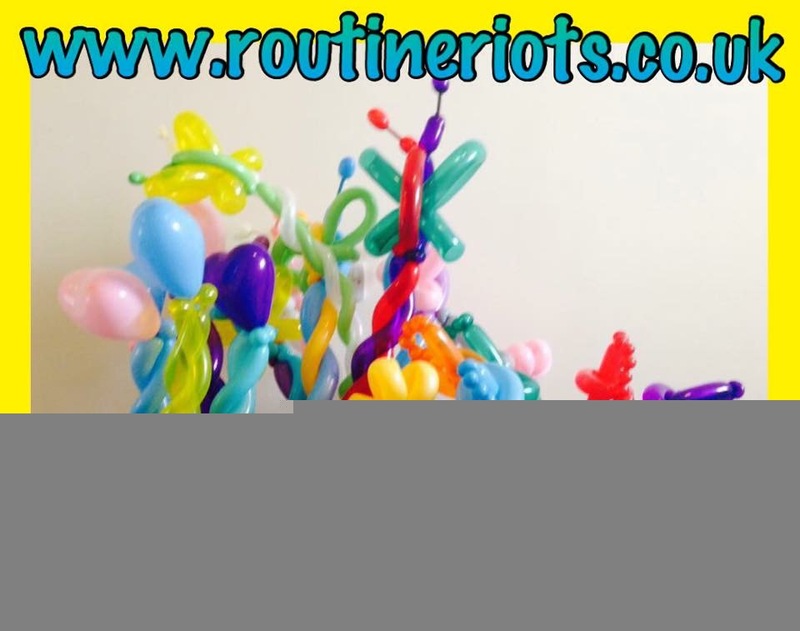 Routine Riots provides magical children’s entertainment! We are based in North Hants but travel to all surrounding areas, to your chosen venue! 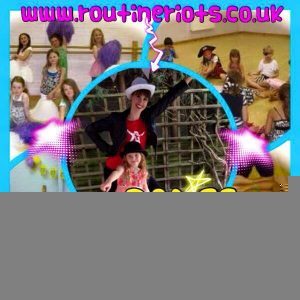 Offering the very best in children’s entertainment and dance tuition, all our staff are very friendly, fully insured and highly skilled, with much experience in teaching, performing and entertaining kids and grown-ups! CHARACTER PARTIES -(3-8years) From swashbuckling pirates and mermaids to enchanting fairies and more, we love to entertain your little ones to make memories that last a lifetime. We provide 60 or 90 minute party packages where your children can dance, sing, enjoy an interactive story time, play with bubbles and props and join in with fun themed games and a pass the parcel. Age adaptable. All children get a certificate. Lots of fun characters to choose from for girls and boys! DANCE PARTIES – For tots (3-5years) we provide an exciting 60 or 90 minute party with lots of dancing and action songs, props, traditional party and dance games and a pass the parcel. Party includes a present for the birthday child and certificates for all the children. High energy fun – Let us know if you have a theme! For older kids (6-16years) we provide a 90 min dance party. There are lots of themes to choose from, street dance to ballet, pop party to Michael Jackson, cheerleading and much more. Kid’s can learn a dance to their favourite song or within their chosen theme. They can take part in a choreography competition too and we provide lots of fun traditional and dance games, and dance activities throughout, including a pass the parcel. They can even show their groovy moves to their parents at the end. Includes present for birthday child and all children get a certificate. 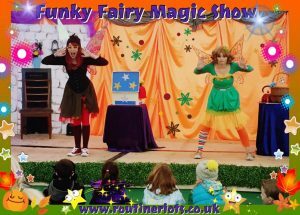 We offer awesome magic shows for children aged 3-7years! 30-90 min packages to choose from. Fully interactive, we have lots of cool tricks, singing and silliness for everyone to join in! Fab for boys and girls. We offer funky fairies or friendly clowns to attend….and keep a look out for their cheeky pet monster Rascal! 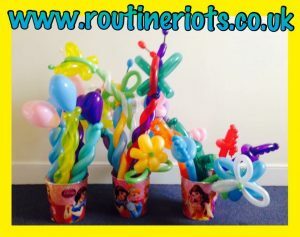 Parties can also include games and balloon twisting. We love face painting and glitter! Available for birthday parties, weddings, christenings, events and more we have lots of fun designs for kids and grown-up’s to choose from! We also offer glitter tattoos. A great addition to any event! Invite Looney Balloony or one of our fun characters to come and balloon twist a variety of crazy balloon models for your next party! From hats to wands, swords to animals, we have lots to offer. We also provide pre twisted balloons for party favours and bunches of flower balloons for special occasions – we deliver too! 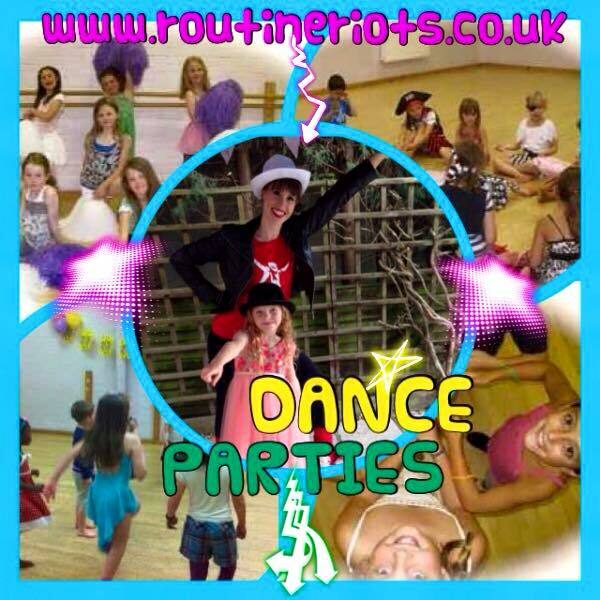 We offer dance parties in many styles for hen do’s, girl’s nights out, birthday parties and corporate events. We also offer 1st wedding dance tuition for the bride and groom or the wedding party as well as private lessons for couples dance. If you would like any further information on any of our services please contact KIM on 07553 866 366 OR kim@routineriots.co.uk today! Or check out our facebook page and lovely reviews from our customers. I met Kate when she came along to the NorthHantsMum Meet up last month. I can confirm that she’s lovely! I didn’t get to chat to her for as long as I would have liked but she’s very enthusiastic about Stretch n Grow and you can see that she loves children. These classes sound so much fun! See further down the post for the exclusive offer for NHM Readers. The Worlds Leading Fun Fitness & Health Programme for Children! **Fun Classes, Birthday Parties & Holiday Clubs for Young Children are all available through Stretch-n-Grow. In my job, it’s not hard to get out of bed in the morning. I can’t think of many jobs that involve spending the day wriggling around on the floor, jumping around the room and singing loudly with a bunch of energetic toddlers and preschoolers who just want to have FUN! And we do have fun, buckets of it, but one of the best bits of my job is that underneath the laughter and noise, there is a very serious purpose to what we do. The biggest kick comes from knowing that not only can our work help children to develop fine motor skills, but by educating them about their body, good nutrition and the importance of keeping active, we can encourage them to develop good habits that can impact on their longer term health. Essentially we can increase their chances of a healthier life. So that’s why I have particularly enjoyed February, the month of love! At Stretch-n-Grow, the learning worksheet module for the month was children’s heart health. In the different settings we visit we speak to the children, (even as young as 1!) about their muscles, healthy eating and what their heart does. We also got their pulses racing with fun movements using active adventure stories & routines, exciting music, age appropriate props & even some obstacle courses & parachute fun. All this is always based around an imaginative theme! So, I hope you were showered in flowers, chocolates and romantic gestures this Valentine’s Day, but let’s show some more love for our your children’s hearts by taking them for a walk up a hill, an adventure in the park, a jump in some puddles, OR even come along to a STRETCH-N-GROW class and let us help make their “Hearts Happy & Bodies Healthy”! **NEW drop in STRETCH-N-GROW CLASS NOW RUNNING WEEKLY! For families with children aged 18mths and above. (younger siblings welcome) Wednesdays in Term Time, 1.30 – 2.15pm, at Curves Studio in Brighton Hill (free parking at Asda.) This class has the option of a pay-as-you-go drop in price or offers are available for advance bookings, whichever suits you. **EASTER CLUBS WILL ALSO BE RUNNING IN THE EASTER HOLIDAYS!! At Chineham Village Hall, for ages 3 -7yr olds. Children are left with us for 2 hrs of Easter Stretch-n-Grow FUN! Come and see why Children and Families Love Stretch-n-Grow!